Notes about Recoverings replicas and other related topics. To leave a comment click on the "comments" link below the post. [dropcap]I[/dropcap] would be remiss if I did not celebrate today’s birthday of James Allen St. John, the master illustrator of the vast majority of Edgar Rice Burroughs books, with this newly finished reconstruction of the artwork for his first color representation of Tarzan on the wraparound cover for THE BEASTS OF TARZAN. Published by AC McClurg in March of 1916, this was the first dust-jacket of thirty that St. John would do for the Tarzan series, the second being another wraparound for THE SON OF TARZAN the next year. 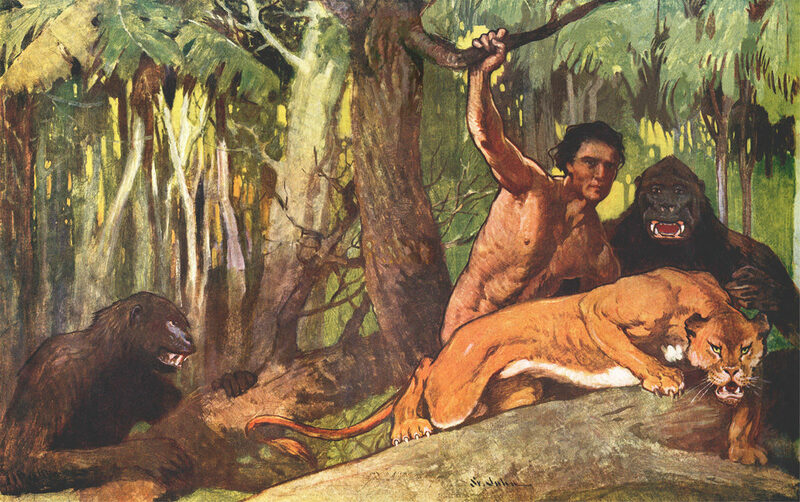 Though he would produce the most memorable covers for ERB’s books, only seven of them were wraparounds, with perhaps his most impressive and action-filled painting for TARZAN AT THE EARTH’S CORE coming at the midway point. Though St. John had done a variety of cover and jacket paintings before this one, none of them had really allowed him the scope that this did. Oddly, the titling on this jacket was strangely rough, and if he had lettered the spine, it must have been unacceptable in some way. McClurg pasted labels in the appropriate places for title, price and publisher and had simple type settings printed on them. I was able to work with a pristine, untrimmed press proof of this jacket and a close look at the red boxes on the spine showed slight shadows indicating that they had been glued onto the art before it was shot for separations. Over the years I’ve wanted to see what this painting might have looked like without the lettering and labels, but I was afraid to tackle the intricate brush strokes on the tree trunk which forms the spine area. I mentioned this to Robert Horvath, a long-time Burroughs fan, artist and now Chairman of the Board of Trustees at the Norman Rockwell Museum in Stockbridge, Massachusetts. Robert is a wonderful painter of historic aircraft and aviation scenes. He asked if he could give it a try with gouache, the material he was certain St. John had used. I printed out a large image of the tree section of the painting on the heaviest paper I had and sent it off to him with wishes for the best of luck. I think it took not much longer than a week before I got the paper board back with a wonderful matchup of the tree trunk, so well done that I could not tell where the painting began over the print. I scanned it and added it as a layer on my working Photoshop file. It took me much longer to finish working over the cover titling—following shapes, replicating textures and strokes—to bring out the full painting as it might have looked originally. I’ll be offering this painting reconstruction as an 11 x 17 inch print on the Recoverings web site this week. It will be a perfect match to the painting for THE SON OF TARZAN print already offered.